The Belgian branch was founded in 1968. It's one of the most important branches in the world. IPMS Belgium is an "association without any lucrative purpose" runned only by volunteers. The publications are produced and distributed by modellers, spending some of their spare time and energy. The association is run following the same principles. IPMS Belgium is managed by modellers for modellers and is not associated to any model producer or sponsor. IPMS Belgium has about 25 sections or affiliated clubs at the moment. These clubs provide, at least once a month, a meeting place where new contacts can be established between members of these or other clubs or even on an international basis. They also prepare exhibitions, competitions, swap meets, guided tours of museums or military bases,... Existing, non affiliated clubs can, of course, apply for a membership to IPMS Belgium. If there's no local section in your neighbourhood, all you have to do is to find 5 IPMS members to create a new branch. The first magazine was edited in Great Britain under the title "The IPMS Magazine". It was distributed to all IPMS members. Later the various national branches launched their own magazines. 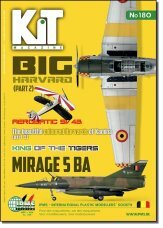 In Belgium, IPMS publishes the quarterly magazine "KIT". In it, you can find articles written by members about very precise subjects and illustrated by drawings, plans and photos, the central interest being models sporting Belgian colours. That does not mean that other subjects are excluded. The "KIT" is distributed freely to the members and some of the older issues are still available through our website : www.ipms.be or at certain model shows. When you register, you can choose "independent" member, if there is a local section in your neighbourhood, we urge you to affiliate through it. Your membership fee can, in some cases, be a little higher, but you will benefit many additional advantages: regional news bulletin, more meetings, less informal contacts,... You can also opt for another section or you can launch your own. You will receive the latest KIT magazine and during the next year you will receive the next three KIT's . Some shops also give a discount when you show them your valid member card. You also receive a discount at the organized events of IPMS Belgium, e.g. free entry at the IPMS National Convention for all members. Click here: Join IPMS Belgium . All you have to do is subscribe through the application form on our website and make your payment. Your member card and your first KIT magazine will be sent as soon as possible.